On January 18, 2012, an estimated 7,000 Web sites world wide were blacked out, in full or in part, as a protest against two proposed pieces of U.S. legislation: the Stop Online Piracy Act (SOPA), introduced in the House of Representatives, and the Protect Intellectual Property Act (PIPA), introduced in the Senate. It was the largest, most widely viewed one-day protest in history. xkcd site blacked out. Click on image for larger version. The merits of the two pieces of legislation have been widely discussed elsewhere, and won’t be discussed here. Instead, let us consider something else: this one-day protest was also the greatest act of industrial sabotage in history. 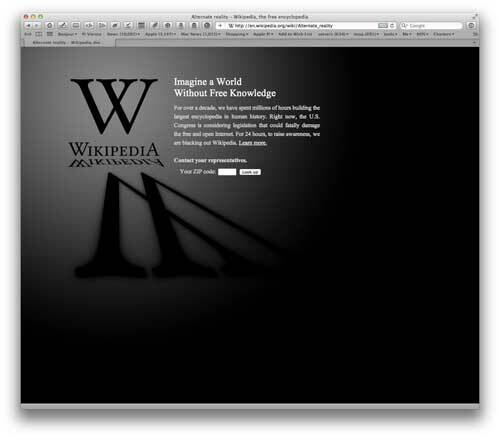 In just 24 hours, an estimated 160 million people went to Wikipedia, and found it blacked out. Many times that number saw Google’s blacked out logo, though Google itself was fully functional. Macintouch, a very popular Macintosh news site, was blacked out, as was the technology magazine Wired, the tech cartoon XKCD, and even such highly specialized sites as Cakewrecks, which specializes in funny critiques of very poorly designed cakes. 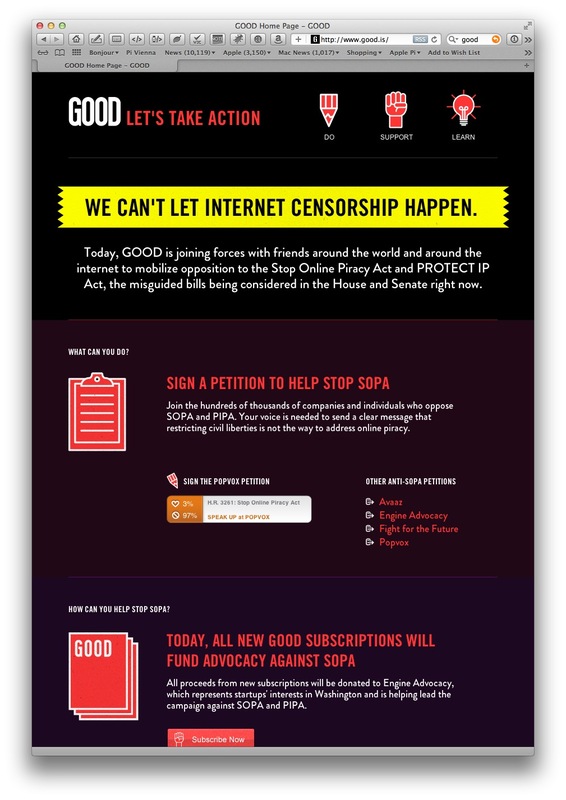 Wired site blacked out. Click on image for larger version. 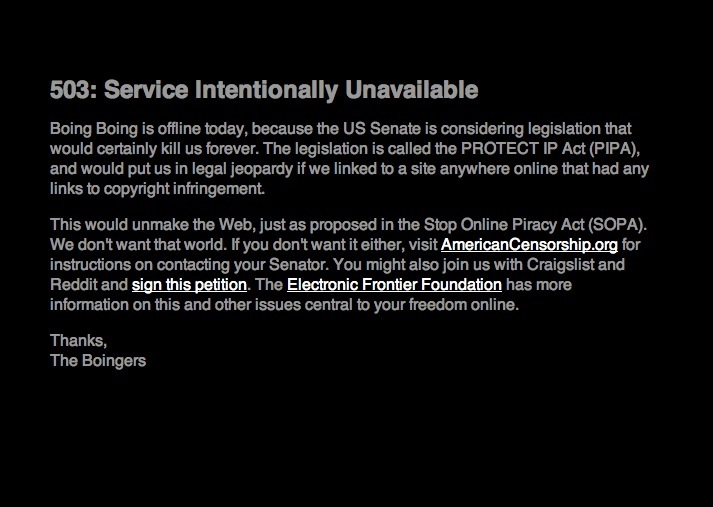 Viewed as sabotage, the blackout illustrates not only the intended political message -- the proposed legislation could cripple millions of Web sites -- but also a more fundamental problem. We live in an electronic age, and depend on the Internet for information, entertainment, commerce, and a host of other services, yet a few thousand loosely organized Web site operators managed to effortlessly shut down a big chunk of the World Wide Web. There was no destruction, and the purpose of the blackout was not malicious, but the power of the few, and the fragility of the many, was on clear display. 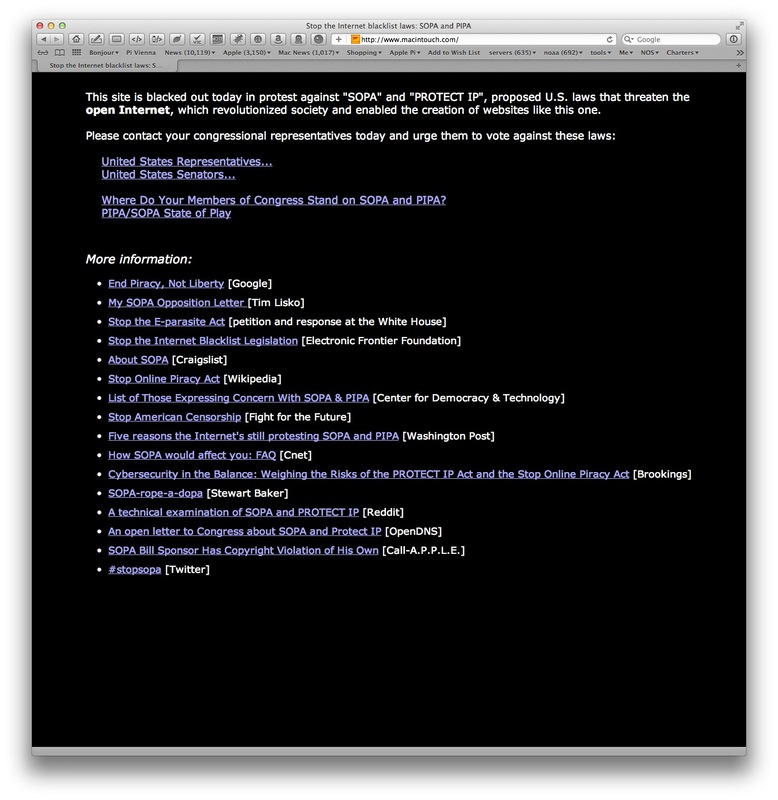 Wikipedia site blacked out. Click on image for larger version. The world’s first major act of industrial sabotage took place on Friday, November 29, 1985, in Japan. A small, radical group, Chukaku-ha, protested for years the government expropriation of farm land for building Tokyo’s Narita International Airport. The protest was going nowhere, so on this otherwise routine workday, Chukaku-ha launched over 30 physical attacks on the communications centers, communications cables and switching centers used by Japan National Railways. The national rail system between Tokyo and Osaka was shut down, 11 million commuters were stranded, and the two largest cities in the country ground to a complete stand-still in the largest traffic jam ever experienced anywhere. I was living in Japan at the time, and this was the first time -- and the last time -- I suffered a train delay in the country. My train eventually arrived 14 hours late. Macintouch blacked out. Click on image for larger version. The next two great sabotage events took place in 2001. On July 19, the Code Red worm infected at least 360,000 Windows computers in roughly twelve hours. During the peak infection period, Code Red was invading 2,000 new hosts every minute. I was in Alaska on a scientific expedition, and was looking for shore facilities to transmit back data collected at sea. Every single computer I tried in Juneau -- at the Harbor Master’s office, at the U.S. Coast Guard station, at the public library, at a commercial Internet cafe -- was non-functional. Good site blacked out. Click on image for larger version. Later that year, in a 24 hour period over September 20-21, the Nimda worm infected machines at an even more torrid pace, leaving 2.2 million dead Windows computers behind. Sporadic attacks by Code Red and Nimda continued for several years. Cakewrecks site blacked out. 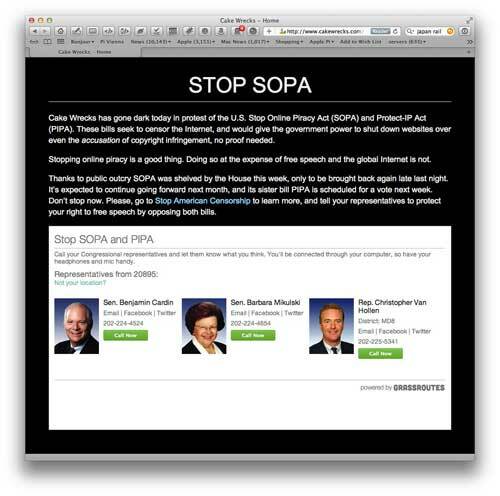 The site took note of your location, and asked you to contact your local senators and representatives. Click on image for larger version. In each of these events -- the Japan National Railway shutdown, the Code Red and Nimda attacks, and the SOPA blackout -- the targets were electronic devices, but the victim was society at large. Our dependence on technology was laid bare. Chukaku-ha physically attacked and destroyed equipment that allowed the world’s most advanced railway system to operate. In the Code Red and Nimda attacks, hackers exploited some gaping holes in the Windows operating system to disrupt hundreds of thousands of businesses, government agencies and private individuals. 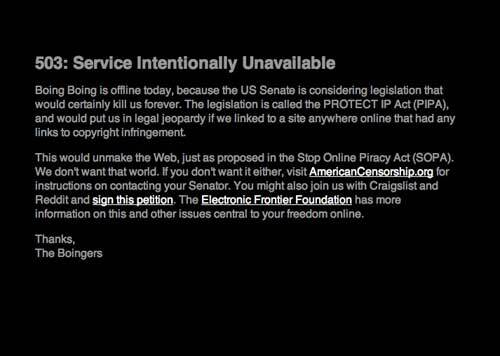 Boingboing site blacked out. Click on image for larger version. The SOPA blackout, while not destructive, had the most pointed message of all: the Web is vulnerable, so don’t deliberately break it.